Kansas State University is saving energy costs and becoming greener by using one of Kansas’ most abundant resources: wind. A new university agreement with Westar Energy will provide approximately 50 percent of the energy needs for the university’s main Manhattan campus from a wind farm in Nemaha County and save the university nearly $200,000 annually. The agreement is part of Westar Energy’s new Renewables Direct program, which provides large customers access to renewable energy at set long-term prices. The program involves the 300-megawatt Soldier Creek Wind Energy Center, which is a wind farm that will be built in Nemaha County and is estimated to be on line in 2020. 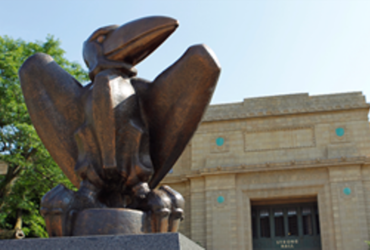 Kansas State University is one of 14 Kansas organizations that will receive electricity from the wind farm. As part of a 20-year agreement, the wind farm will provide Kansas State University with 14 megawatts of power, which is approximately 50 percent of the current load of the university’s Manhattan campus, said Gary Weishaar, university manager of energy and controls. The anticipated savings for the university will be approximately $180,000 to $200,000 annually. The savings will come from a reduction in the retail energy cost adjustment, also known as fuel factor costs, Weishaar said. Under the Renewables Direct program, the price of electricity provided from Soldier Creek Wind Energy Center will be fixed for 20 years at 1.8 cents per kilowatt-hour and replaces the fuel factor cost, which is currently 2.3 cents per kilowatt-hour. The university’s average annual consumption for the Manhattan campus for the last five years has been 113 million kilowatt-hours per year. The university also will receive renewable energy credits associated with the agreement. Westar Energy’s Renewables Direct program is designed to provide large customers a path toward their sustainability goals with Kansas’ abundant, affordable renewable energy. Participating customers are able to claim a portion of the energy generated by the wind farm as their own, retain all of the renewable attributes and lock in a portion of their electricity prices for 20 years. The program is structured to add projects in the future to keep up with the demand for renewable sources.